Say hello to sweet Jake. 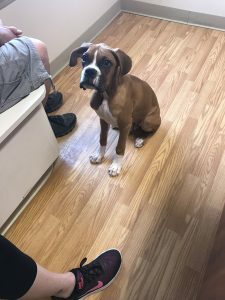 This little boxer puppy is only a few months old and when we first met him he was in severe pain. As most puppies can be, Jake was crazy and loved to play and run. Out of nowhere one Sunday he came up to his folks screaming and crying in pain, hunched up to where he was almost bent in half, and didn’t want to be touched. The vet tried to move his neck and he could hardly do anything. This poor little dude was suffering from a terrible pinched nerve at such a young age. Puppies are prone to acting crazy, so it is not abnormal for them to jam themselves up in ways that we wouldn’t believe. It is not often, however, that they show any symptoms, and because of that many of them will actually end up developing in a structurally incorrect manner. Jake, though in a great deal of pain, is fortunate to have shown symptoms so that the problem could be corrected. Even after his first visit Jake started to improve. He was able to go through mild range of motion and would lift his head ever so slightly. By his third adjustment Jake was 100 percent returned to his normal self. He is leaping and jumping like a crazy boy and all he wants to do is give hugs and kisses. He has so much growing left to do and we are very excited that he will be able to do so pain free! Check out Jake’s before and after videos below.